Headed to the Hudson Valley? The Culinary Institute of America (CIA) is a great tourist destination for any food enthusiast. If you live in Boston, you are likely to have your choice of physicians educated at Harvard, Mass General and other nearby academic institutions. In Los Angeles, everyone seems to have a connection to the excitement of the entertainment industry. In the Hudson Valley—which extends from Albany down to the tip of New York City—our location is especially blessed with a bounty of great restaurants with well-trained chefs. Established in 1946, the non-profit Culinary Institute of America (CIA) in Hyde Park, New York was the first culinary college in the country. As such, it has launched the careers of tens of thousands of chefs and other culinary professionals, some of whom have become international superstars (like Anthony Bourdain, Todd English and Charlie Palmer) and many more who have chosen to remain and work in the region. Another nice thing about living within driving distance of a CIA campus is being able to participate in various classes, demos, lectures, and other special food and wine events offered by the school without the expense of long distance travel. We were invited to a Black Tie and Truffles lunch at the Ristorante Caterina de’ Medici, one of four restaurants on campus that serve as living classrooms for culinary students enrolled at the school. With a three-course menu showcasing dishes prepared with truffles from Asti and Alba, we couldn’t resist. The 170-acre CIA campus sits beside the Hudson River. Most of the buildings on campus are red brick but the exterior of this restaurant looks more like structure you would find in the hills of Tuscany. As soon as we entered, we experienced the warmth of Italy as eager students welcomed us with flutes of Prosecco and offered us several rounds of passed hors d’oeuvres. They included chicken rillettes on crostini topped with micro basil and blood orange; braised chicken and pork empanadas; and fried risotto balls in a tomato sauce. The event was overseen by a Chef-Instructor and a Maitre d’Hotel Instructor. With only eight weeks left in the last semester before this group of students would be receiving their associate degrees, the dining room service was flawless. In the large open kitchen, another group of students prepared the meal, which was tasty and beautifully plated. The three courses included risotto with black truffles and sole filet; roasted veal loin with black truffle sauce and a truffled turnip potato gratin; and a hazelnut mousse dessert with zabaglione and a chocolate truffle. Each course was paired with wines, and talented young students from nearby Bard College offered vocal accompaniments to the meal. The enthusiasm of young culinary professionals is contagious. Their pride and enjoyment in preparing and serving the meal added immeasurably to our enjoyment. We enjoyed making new friends, sharing the table with Rosemary and MaryAnn, two other foodies who relished this special meal as much as we did. Without a doubt, this is one venue where being a guinea pig of sorts is both an honor and pleasure! The Culinary Institute of America was first created to provide career opportunities for World War II vets, but its degree offerings, programs and reach have vastly expanded since then. There are now CIA campuses in St. Helena, California; San Antonio, Texas; and Singapore that train 2800 students per year as well as industry professionals and food enthusiasts. Because of the popularity of the restaurants, advance reservations are required. They can be made on-line or by calling at 1-845-471-6608. If your visit is a last-minute one, no reservations are required at the more informal Apple Pie Bakery Café. 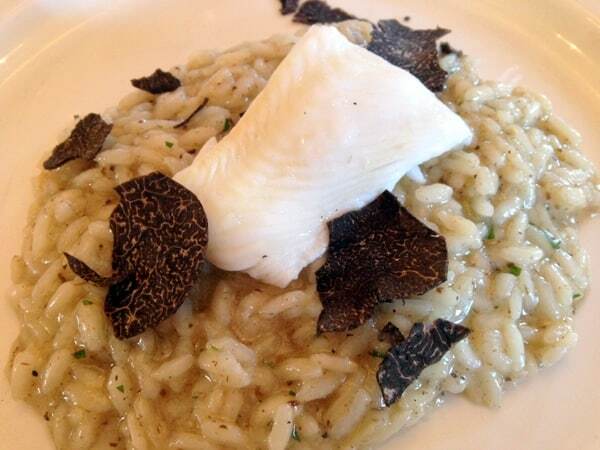 Our black truffle lunch was $55 per person including wines but prices vary based on the meals and menus. For $6 per person, the school also offers campus tours for the public conducted by current students between Mondays and Fridays. Reservations are also required for the tours. Good timing. We might just do this…planning our east coast visit as we speak! There’s a great shop at the school, too, if you are a home cook! So did the men have to show up in black ties? Anyway, the food looks marvelous. We have a similar culinary school in Vancouver – the Pacific Institute of Culinary Arts. They offer multi-course gourmet dinners to the public in their restaurant at a fraction of what you’d pay for a similar dinner elsewhere. We enjoyed one for an anniversary dinner (and come to think of it, we’re going to have to return – just, unfortunately, kind of forgot about it :-). I’m eager to go back to the Bocuse restaurant at the school. When you come visit us in New York, we’ll take you there! That’s a nice comparison of black ties and truffles.The lunch and dinner both looks great and teemed with taste.It become more special at special occasions and with special people with variety of dishes.dishes. You are right,black colour is making the meal more prominent and increasing hunger.